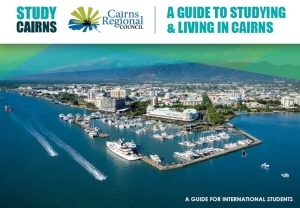 What is the Cairns Student Hub? The Student Hub is an informative, supportive space for international students. Check the Events page to find out what's on at The Hub! Student Hub Cairns is actively seeking Student Ambassadors to represent the international student community and to promote Cairns as a study destination. Apply now to become a Student Ambassador! Cairns offers some of Australia’s most unique international education & training opportunities surrounded by World Heritage icons. View this video in Chinese, German, Japanese & Spanish. The Study Cairns #Hackathon is here! These international students will be brainstorming and working hard to come up with brilliant ideas to improve the experience for everyone that comes to Cairns to study. Please be advised that the Student Hub will be closed Wednesday 17/4 until 2pm. Photos from Cairns Student Hub's post 🍏 What does "She'll be apples" mean? JUTE Theatre Company 👨‍🎤 Acting classes at JUTE Theatre - Term 2 enrolments are now open. International students are encouraged to apply! Thanks for touring the hub and experiencing first-hand what Cairns has to offer its students. Special thanks to the Study Cairns Student Ambassadors for helping to welcome our guests 🙌🏼. Cairns Student Hub was live. Thanks to all the staff, volunteers, workshop facilitators and, most importantly, you the students who make the Cairns Student Hub a warm and welcome space 🙏. Beyond Blue When you’re worried about a loved one, sometimes the simplest of gestures can make the biggest difference. Cairns Student Hub shared a post. Timeline Photos Full house at today’s Job Seekers Workshop! Thanks to Signature Staff & Word Factory for providing their valuable insights! Full house at today’s Job Seekers Workshop! Thanks to @signaturestaff & Word Factory for providing their valuable insights! Photos from Cairns Student Hub's post Please welcome our brand new 2019 Study Cairns Student Ambassadors! The group of 10 proactive, diverse and multidisciplinary students were inducted yesterday at the Cairns Student Hub, and afterwards treated to a sunset BBQ on the esplanade. Please welcome our brand new 2019 Study Cairns Student Ambassadors! Good morning, Cairns! We're thrilled to welcome 240 delegates, 35 speakers and 13 international BDMs for #IETSummit2018. Let's put Queensland on the map! If you know an international student based in Cairns, please tag them below. To all our Cairns based International Student friends, join us THIS FRIDAY (15 June) from 12 to 2pm at the Student Hub! We are hosting a "Meet, Greet & Eat Together" for International Students, Friday 1st of June (4-6pm) at Student Hub on Lake Street. Social BBQ on the Esplanade - have fun and make new friends!